Which Roku Should I Buy? Roku Player Comparison & Buying Guide | Cut Cable, Phone & Energy Cost Using These Simple Tips! Which Home Phone VoIP Service is Right for Me? How to Watch Live Sports Online for Less? How Many OTA Channels Can I Get in My City? Review: is DAZN Live Sports Streaming service worth it? How to Cut Cable TV Bill in Half Legally? How to Choose a VoIP Phone Service Provider? How to Lower Your Cell Phone Bill? Roku streaming players allow you to stream both free and paid contents from online video sources on your TV. For those who aren’t familiar with how Roku works, it is important to point out that all Roku streaming players share the same operating software. This means it doesn’t matter if you own the cheapest or the most expensive Roku player, you will navigate the same user interface on the TV screen. Consequently, it is really the hardware and built-in features that separate each Roku player. In essence, it is all about speed & connectivity (hardware) and convenience (features). But which Roku is the best for you? Read on to find out! In 2016, Roku improved all its streaming devices (except for a couple feature omissions when compared to some previous models) and added two new players to their product line. Roku also took this opportunity to rename all their devices except for the Roku Streaming Stick. Given the expanded product line, you now have six Roku streaming players to choose from: Express, Express+, Streaming Stick, Premiere, Premiere+ and Ultra. We prefer the new names because their former names were pretty rudimentary (Roku 1, 2, 3…). If you are thinking of buying a Roku streaming player, please check out our Roku player comparison table below. We will then help you understand how each Roku feature works. Some features are self-explanatory so we will mainly focus on features requiring an explanation. 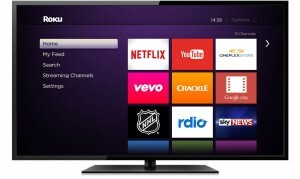 Our goal is to assist you in understanding Roku’s features before deciding which Roku model is the best for your needs. If you are thinking of upgrading your existing Roku player, the same comparison table below can assist in comparing any hardware improvements, new features or omissions from your old Roku player. For instance, you might have upgraded your WiFi router or bought a new 4K TV since you purchased your old Roku. In such cases, our Roku player comparison table and feature explanation will help you decide if it’s worthwhile upgrading. Check out our Roku comparison table below. * 4K/HDR/60 fps requires compatible TV & content. Also check bandwidth requirements. **Voice Search is available on all Roku players via Roku App on a mobile device. ***Private Listening is available on all Roku players via Roku App on a mobile device with headphones. Aside from the Express models, all Roku players have Quad-Core processors. This is a significant hardware improvement considering only Roku 4 from the previous generation was equipped with a Quad-Core processor. It has been reported all Roku players with Quad-Core processors are “snappy” in terms of device booting and channel loading times. The added speed greatly improves a Roku user’s experience. On the other hand, Roku Express and Express+ do not boot or load content-rich channels such as Netflix as quickly. So Netflix subscribers beware. Roku Premiere+ and Roku Ultra are the only models that can connect to the Internet with an Ethernet cable. This is a pity because Roku 2 which is equivalent to Roku Premiere now had an Ethernet port. In other words, you have to shell out more money for this feature. However, this is not a be-all and end-all feature as most Roku players stream perfectly with a proper WiFi connection. Premiere models and Roku Ultra have 802.11ac dual-band MIMO WiFi (5 GHz and 2.4 GHz). Both Express models and Roku Streaming Stick offer 802.11 b/g/n (dual-band MIMO for the Streaming Stick and 2.4 GHz only for the Express models). 802.11ac is the new WiFi standard nowadays. However, 802.11n is still alive and kicking. In fact, 802.11n is no slouch at providing up to real-world 240 Mbps connection bandwidth. The bottom line is: all Roku players should stream without issues even if you have an older wireless router. A Roku device’s internal memory could be expanded via a microSD card. This will result in faster loading time for Roku channels and games if you have used up majority of its internal memory. Roku 2, 3 & 4 had a microSD card slot but now it is only available on Roku Premiere+ and Roku Ultra. Note: microSD card slot is not meant for accessing stored media files, a USB port is. You can play audio and video files stored on local drives (e.g. flash drives or external SSD/HDD drives) when connected to the USB port. Roku 2, 3 & 4 had USB ports but it has become a luxury item since it is now only available on Roku Ultra. Available on all Roku players. Interestingly, only the Express models include an HDMI cable. HDR brings out the best and brightest colours in videos. In order to enjoy HDR, you need HDR compatible TV and contents. Currently, availability of HDR videos is scarce. The best place to find HDR videos on Roku are from Netflix and Amazon Video. Available on Roku Premiere+ and Roku Ultra only. All Roku players can display 1080p video. If you own a 4K TV, Premiere models and Roku Ultra will allow you to maximize your 4K TV’s viewing potential since they support 4K @ 60fps. Roku Express+ is the only Roku player that is compatible with televisions with composite inputs (red/yellow/white). Multiple-channel audio drastically enhances all video viewing experiences. However, to enjoy 5.1-channel surround sound on a Roku player, a home theatre AV receiver (a.k.a. AVR) with an HDMI input is a must. This feature eliminates all unexpected sudden sound surges during video playbacks (e.g. loud explosions while watching a movie). In other words, the feature suppresses the audio to a constant level. Available on Roku Premiere models and Roku Ultra. Available on Roku Premiere+ and Roku Ultra only. Both models come with headphones which you can plug into the headphone jack on the remote control. Good feature to have if you don’t want to disturb anyone while watching videos alone. Note: other Roku models can also get private listening via a mobile device’s headphones using the Roku App. Roku Ultra only. The voice search is performed via Roku Ultra‘s remote control. Again this feature is available for all Roku players via the Roku App. Roku Ultra Remote Gaming Buttons are available on Roku Ultra only. Ultra’s remote control has two extra buttons labelled as “A” and “B” for gaming. You would hold the remote control sideways to use it as a game controller. A neat feature to have if your remote control is always missing in action. 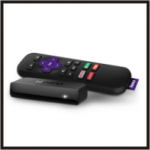 A simple button press on the Roku Ultra device prompts the remote control to emit sound for easier retrieval. 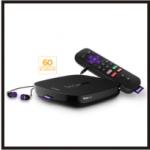 And Our Top Roku Choice is….. Personally, if strictly taking budget and performance into consideration, Roku Streaming Stick jumps to the top of our list. The main reason? It is the least expensive Roku player with a Quad-Core processor. The speedy processor delivers excellent navigation experience in terms of booting and channel loading time including Netflix. In addition, Roku Streaming Stick offers better WiFi performance than the Express models because of its dual-band MIMO capability. It also includes a point-anywhere remote control reserved for higher-end Roku models. The reason for the pricier remote is because Roku Streaming Stick must be plugged into an HDMI port (TV or AV receiver) along with a USB power source to function. The HDMI port may not always be in a line of sight thus a point-anywhere remote is necessary. As indicated throughout the article, many features available on more expensive Roku models are also available to Roku Streaming Stick via the Roku App (notably voice search and private listening). Finally, if you have an Android or Windows device, Roku Streaming Stick is currently the only model which could perform screen mirroring (this feature is coming soon for the Premiere models and Roku Ultra, but unavailable on Express models). Roku Streaming Stick‘s only caveats are: it does not support 4K picture quality (typical omission at its price range) and it will not fit on a wall-mounted TV if the TV’s HDMI port is rear facing. So Which Roku Player Should I Buy? Despite our preference for a Roku Streaming Stick, we realize each person’s budget, existing audio/video gear and viewing habit is unique. Therefore, we will attempt to suggest the best possible Roku player based on a list of different scenarios below. My TV doesn’t have an HDMI input. Can I still use a Roku player? Answer: Yes, Roku Express+ offers Composite AV connection so it will work with a TV without HDMI inputs. I have a 4K TV. Which Roku player supports 4K picture quality? Answer: Roku Premiere models and Roku Ultra. The picture quality will be even better if your TV also supports HDR or 60 fps. Please keep in mind 4K HDR videos are still scarce at the moment and streaming 4K videos requires extensive Internet bandwidth (25Mbps is recommended). Will my older wireless router work with Roku? Answer: Yes, all Roku players’ WiFi connection is backward compatible so it should work with your old router assuming you have 802.11b/g/n. Ultimately, your Internet connection speed and WiFi router quality and its signal strength determines Roku’s picture quality. My home theatre AV receiver doesn’t have any HDMI inputs but I would like to get 5.1 surround sound. Which Roku player should I get? Answer: Roku Ultra is your only choice providing your audio receiver has an optical audio input. I want to buy the cheapest Roku available. Is this a good idea? Answer: It’s never a bad idea at if you have a budget constraint (because you are thinking of savings and this is exactly what our website encourages you to do). However, for 10-20 dollars more, Roku Streaming Stick offers better value because it has a Quad-Core processor, dual-band MIMO WiFi, a point-anywhere remote control and screen mirroring for Android and Window devices. Depending on your Roku usage, it may be a short-term pain (cost wise) but long-term gain with faster speed and better user experience. If you are a Netflix subscriber, Roku Express or Roku Express+ would work fine. The trade-off is: there is a slight lag navigating through Netflix’s menu when compared to other models. But this is only noticeable with a side-by-side comparison and does not affect the video playback. Is this $70 TV-Internet-Home Phone bundle real?! Would you get it? All materials posted on this site are subject to copyrights owned by the site owner. Any reproduction or republication of all or part of any document found on this site is prohibited. The names, trademarks, and logos of this site may not be used in any advertising or publicity, or otherwise to indicate the site owner's affiliation with any product or service, without the site owner's prior written permission. The site owner will make reasonable efforts to include up-to-date information on this site, but the site owner makes no warranties or representations as to its accuracy. All users agree that all access and use of this site and the content thereof is at their own risk. The site owner or any party involved in delivering material via this site are not liable for any direct, incidental, consequential, indirect, or punitive damages arising out of the use of the site, or any errors or omissions in the content thereof. © 2019 Cut Cable, Phone & Energy Cost Using These Simple Tips!